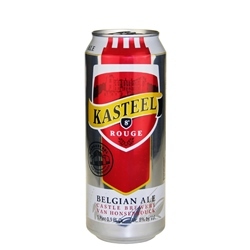 Kasteel Rouge from the Van Honsebrouck Brewery is a fruit beer that pours a deep ruby red with a small pink head. Created by blending a mother-beer (Kasteel Donker which has been allowed to mature at least six months) with the liquor of cherries used for specialty confectionery, the brew boasts strong aromas of cherry and chocolate with notes of yeast and spice. Pair with salad, mild cheeses or light desserts. 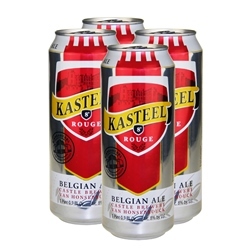 The Van Honsebrouck Brewery (makers of Kasteel beers) began as a small farm and brewery on the outskirts of Ingelmunster in the West Flanders region of Belgium. Purchased in 1900 by husband and wife Emile and Ludovica Van Honsebrouck and expanded in the 1930s by their two sons, major success would elude the brew farm until the 1950s when grandson Luc Van Honsebrouck took over the business. Educated at the brewing schools of Ghent and then gaining practical experience at a large German brewery, Luc would change the direction of the family business by breaking with tradition and concentrating on the production of high quality specialty beers. His vision proved fortunate, and made him a legend in the craft brew industry. Today the Van Honsebrouck Brewery – still family owned and operated – distributes its specialty ales to at least two dozen countries including the United States, Canada, China, Italy, Brazil and Japan.